Remote visual inspection (RVI) is the science of inspecting areas or objects which are inaccessible to the human eye. It is one of the powerful and advanced surface NDE techniques which finds widespread use during preservice, inservice and condition monitoring applications for the examination of turbines, pistons, engines, aircraft frames, tanks, pressure vessels, etc. The advances in image processing and the advent of digital measuring borescopes and fiberscopes have made RVI a quantitative inspection tool. Welding is an indispensable part of any industry. It is the most widely used method for the joining of metals. Though the science and technology of welding is more than 100 years old, weld continues to be the weak link with many failures occurring due to a variety of reasons. One of the most important properties of any completed weld is its external and internal contour. Use of improper setup, electrode, geometry and weld parameters can result in a variety of defects and imperfections. One of the imperfections that could occur due to improper internal shield gas flow and weld parameters is weld concavity and convexity. It is a well known fact that excess reinforcement, convexity and concavity cause a change in the weld profile. Depending on the geometry of the weld, the presence of such convexity and concavity can result in concentration of stresses in and around the region. Under the presence of thermal, hydraulic and other stresses such regions are prone to creep-fatigue damage and have been the cause for many failures. These regions are also prone to corrosion due to stagnation of liquids. Thus codes of practice always place a upper limit on the maximum permissible values of convexity and concavity. The tube to tube sheet welds of the reheater of Prototype Fast Breeder Reactor (PFBR) steam generator are highly critical. This is because, on one side we have sodium and on the other side water. Any failure would thus be catastrophic. The specifications for the evaluation of such welds are thus highly stringent. In the case of convexity and concavity, the maximum permissible values are 0.2 mm (both for internal and external concavity and convexity). It is easy to determine the external convexity and concavity due to availability of access for replica based measurements. In the case of internal concavity and convexity, the technique of replica using dental compounds is quite difficult. Replication using silicon rubber compound and special hardware has been done by the authors for the reheater tubes. However, the cost of making one replica is of the order of US $ 750 thus making this a highly unviable solution for shopfloor inspection of all joints. This paper elucidates a simple but effective methodology based on vedioimagescopy adopted by the authors for quantitative evaluation of concavity and convexity in the tube to tubesheet welds. It is a well known that RVI using fiberscopes finds extensive applications for qualitative inspection of welds. This has been routinely used for the detection of pittings and also concavity and convexity. However, its applications to the quantitative determination of concavity has not been reported so far. The videoimagescope is an advanced version of the flexible fiberscope in which a CCD chip is used for imaging. Compared to fiberscopes, videoimagescopes provide high resolution and brighter images. With the introduction of advanced image management functions and measurement capabilities, the technique of RVI by videoimagescope has become a quantitative one. In this experimental work, the Olympus videoimagescope model IVC-6 was used. This videoimagescope has a diameter of 6 mm and working length of 7 m. A variety of viewing optical adopters with varying fields of view are available which can be used depending on the nature and type of application. In the present experimental campaign, the forward viewing and side viewing optical adopters of field of view 80 degree were used. The light source used was ILV-2 with a 300 W xenon lamp. The unit is linked to IW-2 industrial video analyzer equipped with a built in hard disk for the storage of images. About 400 images can be stored. Each image can be tagged with characters for easy identification and further reference. The images can also be suitably enhanced through image processing functions such as contrast stretching, edge enhancement etc., provided in the system. Using the 3-D graphic measurement system, it is possible to measure accurately the length, width etc of any feature in the the images. The image data can be processed and pasted into documents/reports appropriately. Before the actual work was undertaken, the feasibility of using videoimagescope for quantitative weld profiling and also the accuracy of the method was established. A tube identical in dimensions (OD and ID but of shorter length) to the actual tube was selected. 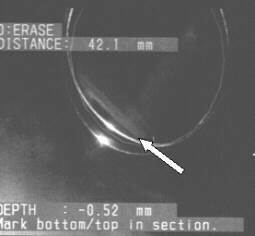 Internal convexity was simulated by placing a steel wires of known diameter (0.4 mm and 0.2 mm) both longitudionally and circumferentially at a distance equivalent to the distance of weld from the face of the tubesheet. Fig. 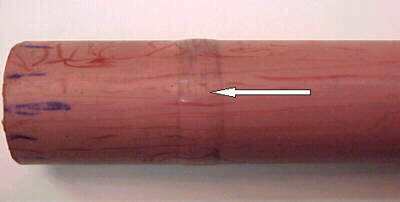 1 shows typical images of the wire placed longitudionally and circumferentially inside the tube. The images were contrast stretched and edge enhanced using the image processing functions available for better delineation of the edge of the convexity. 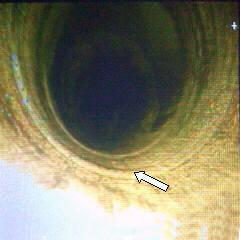 Measurements of the wire diameter were taken at a number of points by placing the videoimagescope inline with the wire. 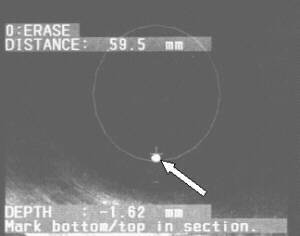 Comparison of the diameters estimated using videoimagescope with the actual diameters measured using a micrometer indicated an accuracy of the order of 20 microns. For concavity measurement, notches and grooves of two different depths (0.35 mm and 0.25 mm) were made internally by electro discharge machining in a standard tube of OD 31.2 mm and ID 27.8 mm. The profile of the groove was then replicated using silicon rubber compound. The dimensions of groove were then measured from the replica using a profile projector having a measurement accuracy of + 5 microns. Fig.2 shows the typical replica of 0.35 mm groove. Fig 2: shows the typical replica of 0. 35 mm groove. The results of concavity measurements by replica and videoimage scope are summarized in Table - 1 below. The reheater of PFBR SG essentially consists of 170 joints (85 tubes welded on either side). The videoimage scope is inserted from the tubesheet side and accurately positioned using a fabricated guide tube. The welds were then profiled using the same methodology adopted for the calibration tubes. More than 100 joints of the reheater were examined by videoimagescopy. Fig.3 is the image of a good weld, while Figs.4 and 5 are images of convexity and concavity in two different weld joints. Some of the joints in which concavity or convexity exceeded the limit of 0. 2 mm were also examined by replica. Typical results of the examination are given in Table - II below. 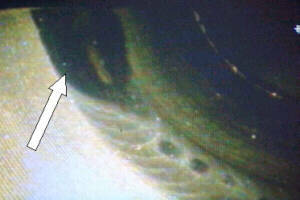 Fig 3: Videoimage of good weld. Fig 4: Typical image of convexity detected in weld Joint. The convexity was 0.437 mm. 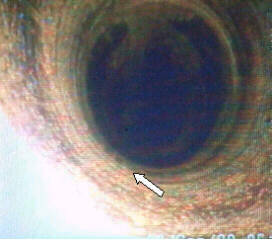 Fig 5: Typical weld concavity detected in one of the reheater joint. The concavity was measured to be 0.44 mm and hence weld was repaired. It can be observed from Table - I and Table - II that the measurements by videoimagescope match well with those by replica method. From Table - I. It can be observed that the accuracy of measurements is about ±45 microns in the case of groove with a concavity of 0.255 mm and about ± 60 microns in the case of groove with a concavity of 0.34 mm. The error is due to the fact that location of the point of maximum depth is highly subjective. This is entirely based on the operators experience and perception. In the case of determination of convexity, the accuracy of measurements is much better since the edge of the convexity can be judged very well. This has also been enhanced through the application of image analysis procedures such as edge enhancement after contrast stretching. Thus the end point for measurement could be fixed accurately for determination of the dimensions. It can be observed from the above that videoimagescope offers a simple and effective solution for profiling of weld internals. Compared to the replica method which is not only uneconomical but also time consuming since it takes about 6 hours for curing of compound, the time taken for profiling each weld is less than 30 minutes. An overall accuracy of the order of 20 microns in the case of convexity measurements and about 50 microns in case of concavity measurements could be achieved. The method has been successfully employed for the profiling of more than 100 joints of reheater. The authors are grateful to Dr. Placid Rodriguez, Director, Indira Gandhi Centre for Atomic Research (IGCAR), Kalpakkam for his keen encouragement and constant support. The authors are indebted to Dr. Baldev Raj, Director, Materials, Metallurgy, Chemical and Reprocessing Group, IGCAR for his guidance and valuable advice through out the period of experimentation. Authors are also thankful to Shri S.B.Bhoje, Director, Reactor Group, Shri S.C.Chetal, Associate Director, Engineering Development Group and Shri V.K.Sethi Project Engineer (MT), IGCAR for referring the problem and to Shri P.Balaraman for his support during experimentation.